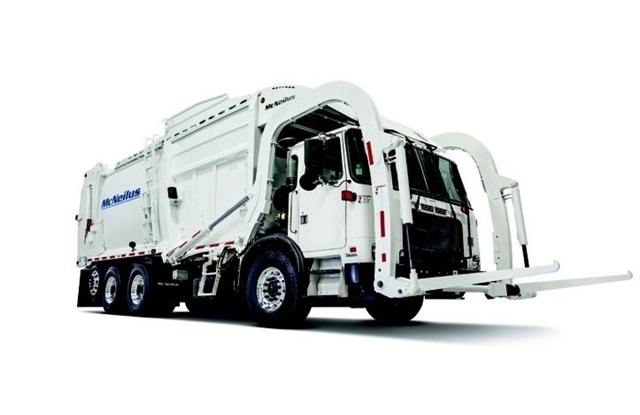 McNeilus Truck & Manufacturing has added the Meridian front loader to the company’s lineup of refuse vehicles. The 16,800-pound truck has a 14-ton payload and is rated to lift 10,000 pounds. Its design combines lighter-weight materials with a durable construction for commercial and residential applications. The Meridian features a clear headframe, underbody hydraulics and an electrical sidewall panel for easier access and serviceability. The hydraulic valves have been moved underneath the body rather than on the headframe to hedge against problems caused by leaks and to provide protection from hot exhaust. The electrical components are protected from heat and refuse debris by an enclosed sidewall panel. The Meridian is also available with the McNeilus NGEN Tailgate CNG system offered in 60, 75, 90 and 105 DGE capacities. The truck also includes the McNeilus CODE technology to provide diagnostics and troubleshooting capabilities. The CODE system features an integrated “smart” fuse panel, intuitive display, adjustable parameters and features like pre-trip reminders and vehicle status messages.